Consuming Passions is a multi-part series of my column, Eating Niagara, that appears every second Wednesday the local dailies. It’s about the passion projects of the people in Niagara’s food and beverage industries. 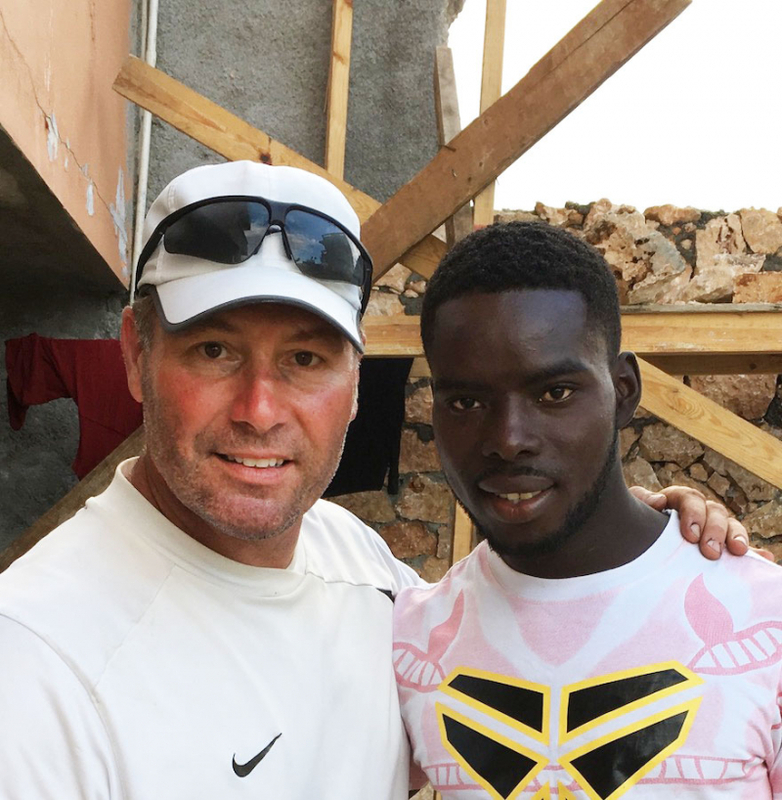 This profile of Brian Schmidt and his volunteer work in Haiti is part one in the series. It wasn’t always like that. Before 2013, Schmidt, like many, didn’t give the impoverished island nation a thought beyond the headlines that may have been working their way through the current news cycle. “I new Haiti had voodoo dolls. I knew Justin Timberlake sang a song about Haiti and a whole bunch of money went to Haiti,” Schmidt recalls about the pop star’s version of Leonard Cohen’s Hallejuah that raised money after the catastrophic earthquake in 2010, which killed more than 100,000 people. These days, though, Schmidt knows a lot more. He knows the names of people living in Haiti — in the village of Numero Deux, more specifically. He can recall their faces and their stories with ease. He knows the challenges they face living in a relatively isolated area in Haiti’s southwest corner. And he knows what’s being done to help them, including drilling wells and building concrete homes, schools and churches that can better weather Mother Nature’s wrath. Schmidt knows all of this because he’s lent a hand more than once to those very projects. He plans to do it again in May when he returns to Numero Deux for his fifth time as a member of Haiti Mission, Inc., a Louisiana-based grassroots development organization dedicated to improving infrastructure — and ultimately lives — there. Helping Haitians with the basics, he says, means one less thing they have to worry about in their every day lives. It enables them to meet other needs. And it’s become Schmidt’s passion to help them do that however he can. Still, it took some convincing that helping in Haiti was his calling. Schmidt’s formal introduction to the country came in 2013 when he chaperoned his son Connor’s youth group on a nine-day volunteer stint with Haiti Mission. Soon after landing in Port-au-Prince with eight teenagers, he worried the trip was a mistake. People begged relentlessly for money. In their short interactions with everyone from baggage handlers to airport staff, life stories were summed up with a similar theme: desperation. Vineland Estates winemaker Brian Schmidt (centre) with residents of the Haitian village Numero Deux. Schmidt has visited the village four times to help a U.S.-based development organization build homes and wells in the community. Photos for this post supplied by Brian Schmidt. Nine days sounded like an eternity but once the group arrived in Numero Deux, a 45-minute flight from Port-au-Prince, and connected with a local priest involved with Haiti Mission, Schmidt’s perspective shifted. He was in no hurry to return after that trip, however, opting instead to send money regularly to Haiti Mission and only making loose plans to go back. They firmed up quickly after Hurricane Matthew hit Haiti in October 2016 and the Category 5 storm bore down on Numero Deux. As he took in the satellite views of Matthew’s path, Schmidt couldn’t shake the image of a young girl named Talia, the three-year-old daughter of his translator on that 2013 trip. He was convinced she — and everyone else he met in Numero Deux — was dead. Instead, they survived by seeking shelter in the concrete homes that Haiti Mission had already built. Two months after Matthew, Schmidt returned to Numero Deux with donations from friends to build more homes and repair wells with Haiti Mission. So far the group has constructed 121 concrete homes in addition to supporting the local orphanage, building a school, and drilling and repairing water wells within 500 feet of every family. The goal is to make Numero Deux a model community with infrastructure and economic opportunity for its people, finishing there before moving on to help another community. Schmidt, who’s returned three times since Hurricane Matthew, can’t recall stories of the injuries and desperation he witnessed after the storm without being overcome with emotion. Ditto when talks about the pure joy residents show when wells start working again, or even when doing something as simple as attending church service. “I overlay that in our world and I ask what is that we do in our world that brings us joy? What are the simple things that bring us joy?” Schmidt asks. But he worries about sounding “preachy” when he ponders those questions out loud. So the man who funds his trips and contributes to Haiti Mission with money from his consulting side hustle focuses discussions on the people of Numero Deux he’s befriended instead. As quick as the tears can come, so can a smile when he sees a photo of Talia’s beaming face or a group selfie with local men on house builds. Such a lovely story with a lovely message for all.